Erica Gutiérrez is from L.A., but she’s been living in Barcelona for long enough that her suggestion for a guest post for the TBEX blog was an overview of three of the city’s neighborhoods. On this virtual walk, you’ll begin to get a picture of historic Barcelona – so when you wander the city streets either before or after TBEX this year, keep Erica’s words in mind! Together, el Barri Gòtic, L’Eixample and Gràcia, give you a sense of Barcelona’s historical evolution and cultural fabric, representing the face of modern Barcelona today. The Gothic quarter is made up of a Roman core dating back over 2,000 years, as well as medieval suburbs such as el Borne and el Raval. Only there can you still see most of Barcelona’s well-preserved Roman ruins and gothic architecture. In the mid-19th century, the Eixample, literally meaning “extension” in Catalan, brings together the old medieval city and other small settlements forming outside Barcelona, such as the village of Gràcia. 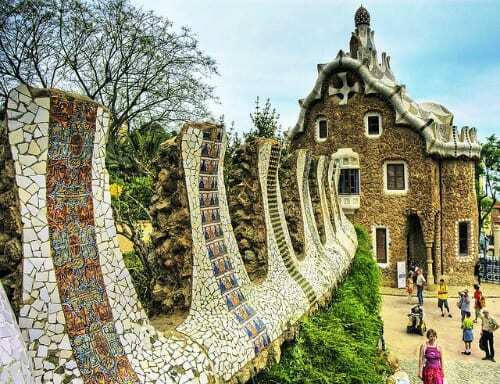 With so many layers to unravel, it’s no wonder Barcelona has often been called the great enchantress. The city’s character and growth is easy to trace starting from here. Near Drassanes, Barcelona’s old shipyards and port, stands a statue of Christopher Columbus built just in time for the city’s first World Fair in 1888. Oddly, Columbus points out towards the Mediterranean, only hinting at Spain’s later exploration to the Americas. His body towers over La Rambla, a seemingly unending and sinuous street that was once a seasonal river just outside of Barcelona’s second set of medieval walls. Throughout the Middle Ages, market stalls and monasteries began to appear all along this street, converting it into Barcelona’s most important thoroughfare for hundreds of years. Today, the generously tree-lined street is home to Barcelona’s most eccentric artists in costumes, waiting for tourists to stroll by, gawk and – hopefully – tip them for their outlandish and entertaining performances. It is also here where you can visit Barcelona’s famous open market, La Boqueria, and its first opera house, El Liceu. The district of L’Eixample truly manifests the quintessential Catalan expression, la rauxa i el seny, referring to the point where good sense and reckless spontaneity meet. 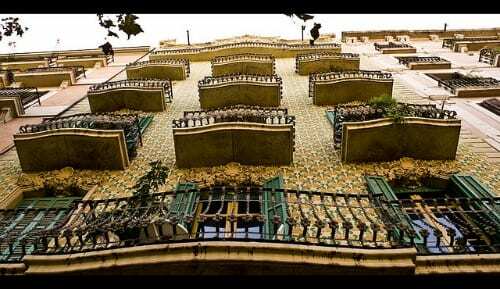 Here, the city’s modern and rational grid is rejected only decades later by the whimsical vibrant designs of the Catalan modernist architects. Just a few blocks north of Passeig de Gràcia, Barcelona’s classiest street today, you reach the Illa de la Discòrdia, or island of disaccord, which makes reference to the apple of discontent in Greek mythology. On this city block, you can see three modernist gems standing side by side, united in clear competition. L’Eixample Esquerre (or left) and L’Eixample Dret (or right), also embody a tangible historical divide. The left has always exhibited a more liberal or progressive tendency, and the right, a more conservative one. It’s no wonder that today, Barcelona’s gay district is on the left, and that the Sagrada Familia, Antoni Gaudi’s still unfinished magnum opus, is firmly rooted on the right side of L’Eixample. The neighborhood of Gràcia gives you a sense of how other villages outside of Barcelona sprouted up over time since the Middle Ages, taking on a distinctive character. Gràcia has a unique community feel, and can be a welcome respite from the crowds in the Gothic quarter, and the traffic and buildings of the Eixample. Today, students, hippy-types and families alike, call this area home. There are several charming public plazas, inviting visitors and residents to enjoy a drink while people-watching. Carrer Verdi has an interesting selection of restaurants, many offering international fare, as well as several small theatres, where films are screened in their original language. 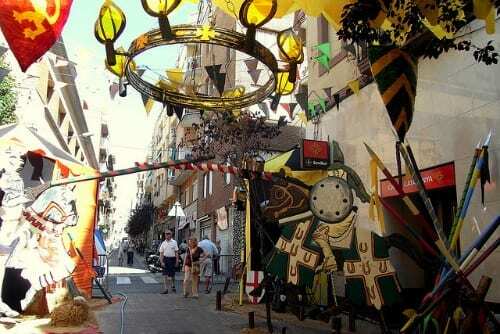 If you are lucky enough to visit at the end of August, the annual Festa Mayor de Gràcia portrays the resilience and spirit of the local community, as neighbors come together to decorate their streets with thematic paper-mâché designs, in friendly competition. Erica Gutiérrez is a city planner, social media lover and adventurer originally from Los Angeles. She currently lives in Barcelona, where she works as a freelance docent and blogger. You can visit her website and blog at: ericagut.com. These are some good ones, especially Gracia. I agree with Julie that Poble Sec deserves a mention, especially as it is near there that Ferran Adria opened new Tickets and 41. Other barris that get overlooked? Poble Nou is very cool and residential and on the beach. They say the best bravas in all of Barcelona are found in Saria, but I can’t confirm that. 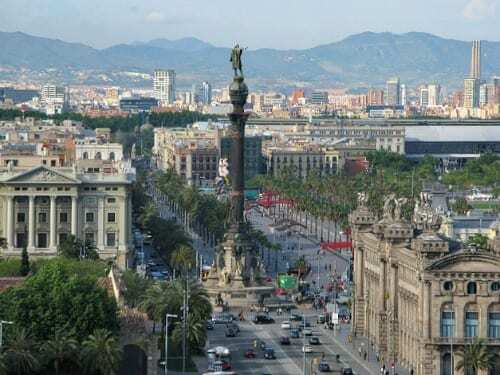 I live in Barcelona, and though the Eixample does have all the Modernista glitz, it also has all the noise and traffic – I would not want to live there (but Iots of people love it! ).